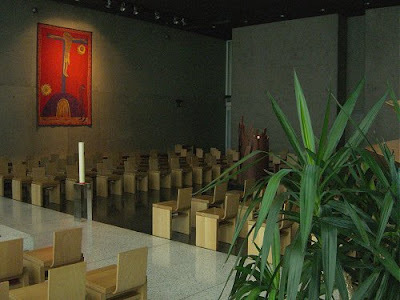 New forms meet old traditions in the church of Notre Dame de Pentecôte in Paris. 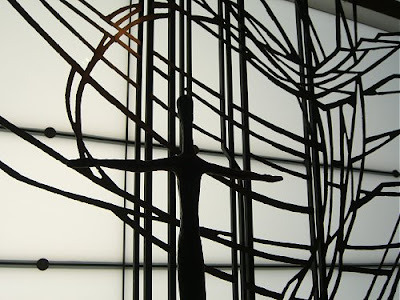 French architect Franck Hammoutène's 2001 design uses a 115 feet tall front wall of translucent glass wall which can be seen in my centre photo. 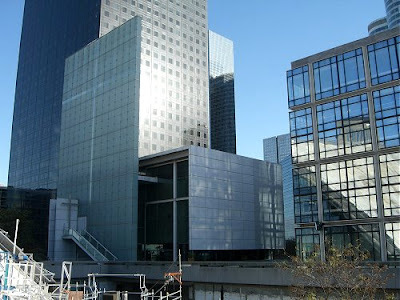 L'Eglise de Notre Dame de Pentecôte is in François Mitterrand's monumental contribution to the Paris skyline, the new la Défense business district. This temple to the free market overlooks the campus of Paris West University Nanterre, which was at the centre of the unrest that sparked the 1968 student riots in Paris. In 1968 the demonstrators may have been chanting Vive la Révolution! but today financial service and technology consultancy employees from the surrounding tower blocks form a large part of the congregation for the new church. On the day I took these photos in November 2009 there was a very different demonstration of new forms meeting old traditions. Giant photos of Tiger Woods promoting the Accenture management consultancy graced the elevated walkways of la Défense while elsewhere the media speculated in equally graphic terms on the golfer's latest struggles in the rough. New forms meeting old traditions also provides the soundtrack for my photo essay. French composer Charles Tournemire (1870-1939) is forever linked with his monumental organ cycle L'Orgue Mystique based on Gregorian chant, and the rest of his output is largely forgotten. But Tournemire was a prolific composer and his catalogue of just seventy-six opus numbers is very deceptive. Just three opus numbers (55 to 57) account for the almost fifteen hours of L'Orgue Mystique, while one opus (52) comprises a massive trilogy of oratorios titled Faust, Don Quichotte and Saint François d'Assise that has yet to be performed. Probably most interesting are Charles Tournemire's eight symphonies. The first five were composed before 1914 and were well received in performance. But his last three symphonies, composed between 1914 and 1924, were victims of the change in musical fashions after the First World War and remained unperformed until they were recorded in the 1990s. Among them was the mighty sixth which lasts for fifty-five minutes and is scored for large orchestra, tenor solo and mixed choir. Although Tournemire's music fell foul of fashion it is by no means reactionary and his bold scoring explores the outer reaches of tonality. Below is the 1997 recording of Tournemire's best known symphony, his Fifth (what is it about Fifth Symphonies?) in a coupling with the Eighth made by the Orchestre Philharmonique de Liège conducted by Pierre Bartholomée, who is a contemporary composer in his own right. The excellent sleeve notes for this CD, on which this article draws, are by Belgian musicologist Harry Halbreich, who interestingly contributed an essay to a recent re-release of Iannis Xenakis' chamber music. Sadly this recording and Marco Polo's complete cycle of the Tournemire symphonies are now deleted, although individual discs remain available. Regular readers will know that I now refuse to play the 'forgotten masterpiece by a neglected genius' game. 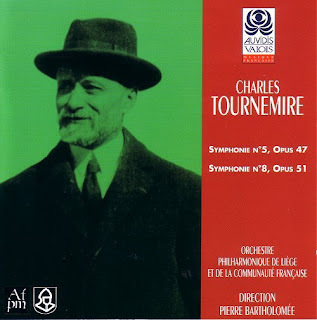 Anyway, it would be foolhardy to pretend that Charles Touremire's orchestral output changed the direction of modern music. But these are honest compositions whose main interest lies in their origins in the period of transition from old to new in twentieth century music. 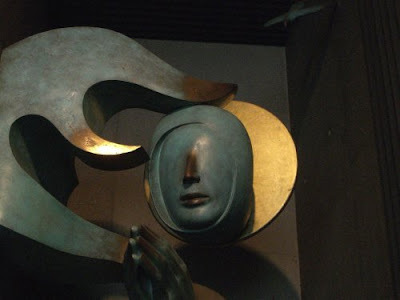 While Tournemire was exploring the outer reaches of tonality in his late symphonies, the young Messiaen was being exposed to the older composer's celebrated organ improvisations at the Basilique Sainte-Clotilde, Paris. 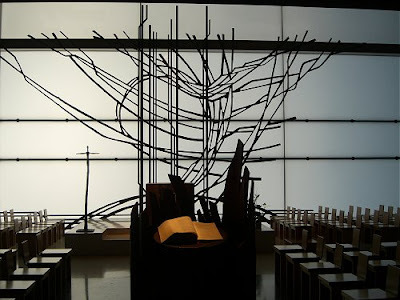 Although Messiaen was never one of his pupils, Tournemire's influence on him is now recognised; moreover both composers were deeply influenced by the mystical elements of the Roman Rite and both wrote major works on the subject of Saint François d'Assise. For these reasons alone Charles Tournemire, the 140th anniversary of whose birth is celebrated in 2010, deserves to be recognised as more than Catholicism's most prolific composer for organ. Also worth exploring are the symphonies of Albéric Magnard, who was a contemporary of Tournemire. Another mix of modern ecclesiastical architecture and organ music here. Leave it to Pliable to alert us once again to fine, subtle works by a composer typecast by a single genre. I've long enjoyed Naxos' Tournemire set by Antonio de Almeida (my being unaware of the Valois edition until now). Though not the last word in polish the Naxos performances nonetheless urged further exploration of the composer. I hope many others will respond to your post by doing so.